Mod edit. This is a very good concept thread TingJunkie! It is now stickied and I have added the term "Official" to the title. 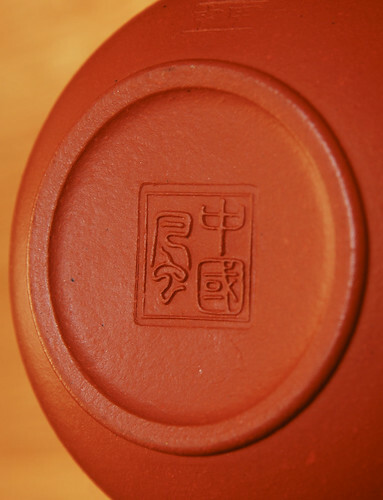 On this forum, Yixing pots are some of the most discussed, yet least understood kinds of teaware out there. In an effort to educate ourselves on clay types, pot shapes and sizes, clay sources and vintages, pot/tea pairings, etc., some of us spend hours pouring over countless threads and links. Luckily, due to lots of sharing from some generous and very knowledgeable people here, there is quite a decent amount of info about these perplexing and alluring vessels on TeaChat. That being said, many of us (myself included) are mere beginners in terms of knowledge. Asking "What's the best type of clay for x tea?" or, "What's the best shape for y tea?" is ok, but it can only get us so far. Those of us who have plunged far enough down the rabbit hole, usually come to some similar conclusions, namely: there is no best anything! 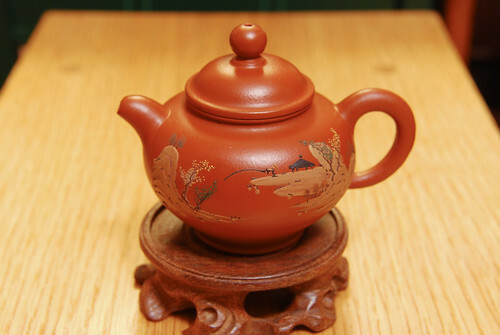 Vintage zhuni is not always magic, there are good modern pots, and sometimes cheap pots can work as well as expensive ones. On top of that, everyone has different tastes, and it's all subjective in the end! 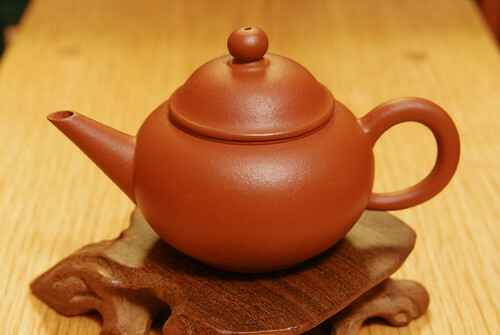 So, for the betterment of the teaware forum, I propose a new approach to learning about Yixing clay and pots. Instead of asking questions which may not have any ultimate answer, let's post info and photos about some of our favorite pots in the hopes of learning what works well for other members. In this way, perhaps we can answer some questions before they are even asked. 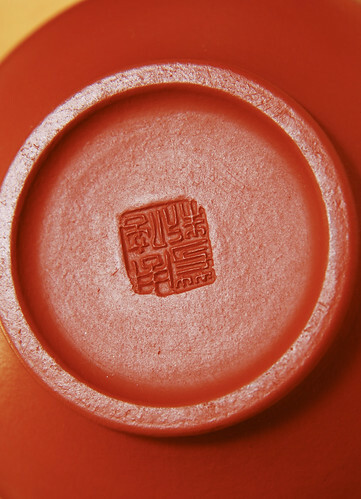 - Clay type (zhu ni, hong ni, zi ni, duan ni, zisha, etc.) Low/Med/High fired? - Size of pot in ml or oz. - What year/decade the pot was made. - How long is the pour? - Where you acquired the pot. - What type of tea you make with it. - What qualities the pot has on tea. i.e. Why do you like to brew a certain tea in it, and what does it do for that tea? Last edited by tingjunkie on Dec 4th 09 2:26 am, edited 1 time in total. Re: A different kind of Yixing pot thread... and Show-off! I'll be happy to get things started. Sorry for the crappy indoor lighting, but I was motivated to get this done tonight. Feel free to copy and paste the format. Clay: Hong Ni. Med-high fired. Pour: +/- 8 sec. No drips. Good lid fit. 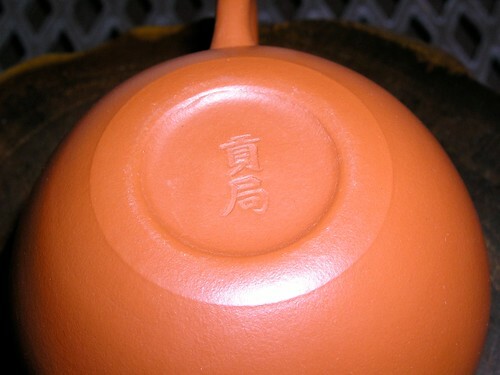 Info: This pot is excellent for protecting the higher floral/fruity notes in a lightly roasted oolong. It doesn't really round any of the flavors, and keeps aromas very well intact. What I like about this pot the most is that it seems to increase and prolong the lingering finish of lighter oolongs and keep the "perfume" going longer in my mouth when compared to a gaiwan. The pot doesn't change the mouthfeel of the tea too much. If anything, it makes the tea feel a bit smoother and perhaps a little more dry- though the dryness is getting less and less the more I use it. Last edited by tingjunkie on Dec 4th 09 3:13 am, edited 2 times in total. Last edited by Maitre_Tea on Dec 4th 09 2:28 am, edited 2 times in total. hey! you beat me to posting about the Tea Gallery pot! Maitre_Tea wrote: hey! 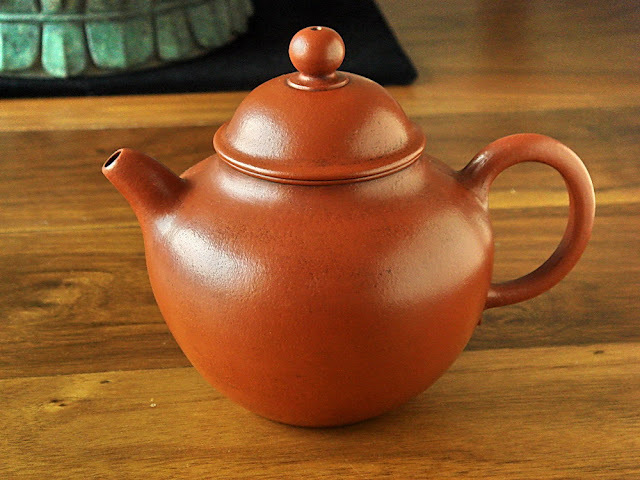 you beat me to posting about the Tea Gallery pot! I only own two pots! Let me have it. I'd love you to post your impression too though! Mod post. This is a very good concept thread TJ! I propose if you all like, we make this the "official Yixing topic" and thus sticky it! I will delete this post once I hear some PM feedback. So, let me know via PM so we do not clutter this topic with discussion of "to sticky or not to sticky." I really like the idea of this thread, we can inject some science in with the mysticism and egos. I don't actually own any yixing yet, I've been doing most of my brewing in glass and porcelain, but I've been thinking about making the plunge. I'll probably start out with one of the cheaper ones from rishi though, I've heard they are pretty good quality for the price. I'm looking forward to seeing more posts on the subject. 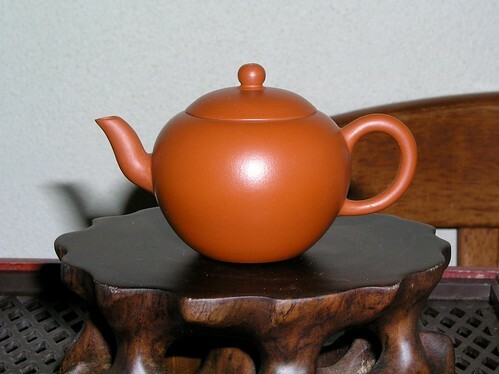 By the way, I checked out the theteagallery.com website and didn't see any yixing. Am I looking in the wrong place? Margules wrote: By the way, I checked out the theteagallery.com website and didn't see any yixing. Am I looking in the wrong place? Clay: Hong Ni. Very high fired. Think it's likely slip-cast though. Pour: +/- 7 sec. No drips. Air tight lid fit. Tea Pairing: Still deciding! Works well for med-high roast Wuyi, except the opening is rather small for the long leaves. Aged sheng works reasonably well too. Info: This little pot craps all over the theory that you can tell a pot's quality by it's sound! I bought it for $25 and it sounds almost as good as any pot in Hou De's video. I'm still trying to zero in on the perfect tea pairing though. Since it is extremely high fired, it maintains aromas and flavors reasonably well, though it does tend to round the higher notes some. Due to that, its thick heat-retaining walls, and the very fast pour, I think it works well for most heavily roasted Wuyi's- taming just a little of the charcoal roast flavors. If the opening of the pot was wider, I think I would have dedicated it by now. That being said, it does seem to work quite well for aged pu as well, but I need more experimentation there. Oddly enough, I would have thought it is the perfect shape and thickness for heavily roasted TGY, but it just doesn't seem to mesh well with those teas for some reason. 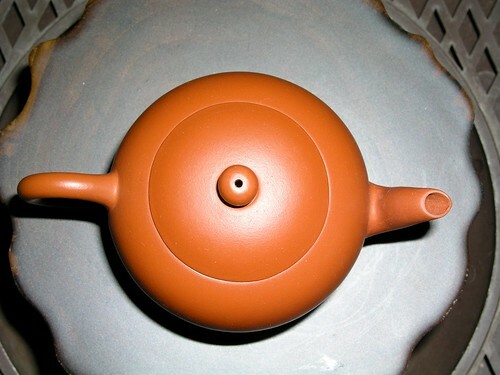 As far as mouthfeel, the pot makes teas noticeably smoother, and a bit heavier/rounder on the tongue. Last edited by tingjunkie on Dec 5th 09 6:03 am, edited 1 time in total. - Clay type: Zhuni. High fired. - Size of pot: 180ml approx. - Age:Either an 80's copy or much older. - Thickness:Thin on the thick side. - Pour: Single hole. Never thought about it. - Qualities: I like the way it looks, feels. Good flavor and aroma. That looks well used and well loved Tead-Off! Do you prefer lightly or heavily roasted rolled oolongs in it, or does it do it all? tingjunkie wrote: That looks well used and well loved Tead-Off! Do you prefer lightly or heavily roasted rolled oolongs in it, or does it do it all? I rarely drink heavily roasted oolongs. Sometimes a medium roasted Dong Ding will make it into the pot but I like the Taiwan high mountain greener oolongs, especially the Li Shan and Shan Lin Xi grown teas. Any high fired and reasonably dense ceramic should "ping" like that. In fact, it is a fairly common method to quickly determine if vintage porcelain pieces have any small chips or cracks. I imagine that slip cast pots frequently ring nicely, as the uniform thickness that slip casting allows is good for resonance. Info: Not much info on this pot, but it brew one heck of a good round of DHP. Brings to surface every detailed nuances and high notes in a well graded and aged DHP.